This Chapter discusses the details of reading, writing, creating, and opening files in java programming. The java.io package contains the types required to perform input/output operations in Java. There are a wide array of file I/O methods to choose from. Java's Input/Output (I/O) libraries are designed in an abstract way that enables you to read from external source of data sources and write to external targets, regardless of the kind of thing you’re writing to or reading from. When you work with files for I/O, you basically work with streams . A stream may be defined as a sequence of bytes . Input streams transfer bytes of data into a Java program from external resource, while Output streams transfer bytes of data from Java to some external target. 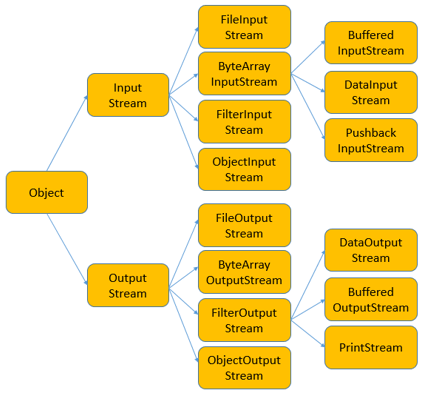 The stream classes in Java, such as FileInputStream , are byte-oriented. They read and write data one byte at a time or in groups of bytes. Most of the classes that work directly with streams are part of the java.io package. The two main classes are java.io.InputStream and java.io.OutputStream . These are abstract base classes for many different subclasses with more specialized abilities. New I/O (in packages java.nio), introduced in JDK 1.4, for more efficient buffer-based I/O. JDK 1.5 introduces the formatted text-I/O via new classes java.util.Scanner and Formatter , and C-like printf() and format() methods for formatted output using format specifiers. JDK 1.7 enhances supports for file I/O via the so-called NIO.2 (non-blocking I/O) in new package java.nio.file and its auxiliary packages. It also introduces a new try-with-resources syntax to simplify the coding of close() method. To use Java's input/output classes, make sure that in addition to importing any other necessary packages, also import the java.io package and the java.util package : import java.io. *; import java.util.*; . From the following chapters, you can learn these classes in detail.